I think these things only happen to me or I’m the only one who pays attention. Last week I was in a Doubletree Hotel and overheard a conversation between the hotel manager and a group of women waiting to be seated. The women were complaining about how long it was taking to be seated, one woman said it was a 1/2 hour but seemed like an eternity. Up comes the manager who asks if they had been waiting long, to which one woman replied (with a smile on her face) “at least an hour!” The manager’s reply, “well we’re not busy so it must be because we’re lazy.” I was horrified but if there was a sarcasm contest going on he won. Everyone chuckled as the women were seated. By the way, he was correct, the waiters weren’t doing anything other than rearranging the napkins while the women glared. 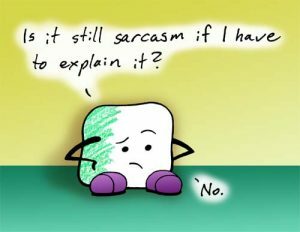 I know that humor can lighten up a situation and everyone gets attention for their “cleverness” but sarcasm seems like a power play to me. It reminds me of comments from managers to their lazy help; “hey don’t work so hard!” Boy the way, I added a couple of jokes to see if you have a sense of humor. Here’s the problem, when a business chooses to be sarcastic in this type of situation they miss an opportunity to give what I call “red hot customer service.” If you take the comment seriously you get to make a bigger power play! You get to make relationship points by showing the customer how observant and thoughtful you are. But if you choose sarcasm and want some tips you should listen to Groucho Marks. He was the king of sarcasm. Did I tell you manager commented on the fact that it looked like I had licked my plate clean? Well I hadn’t. If you want to create outstanding service for your customers I believe you have to take all comments seriously. It was obvious that the customer was annoyed but what did she get for it? Just a dose of sarcasm with her iced tea. I would have suggested that the manager ask if they had really been waiting for an hour, to which she may have confessed to only a 1/2 hour. He could have said “it doesn’t matter how long, you really shouldn’t have to wait when we’re not busy.” His next line might have been, “how about we give you a free appetizer for your inconvenience?” She would have either backed down or agreed. In either case she looks really powerful to her friends and the manager gets to practice his super great customer service skills. Frankly I’m not sure if he attended that part of the customer service training particulary after his comment about my plate. Hey I like a good joke but it’s better if it has nothing to do with me.﻿ I loved the story about the man in Vegas shopping in Macy’s and asking if he could have the bottle of water at the cash register. The clerk replied he could if he had a $1.50, oh how funny. Apparently the clerk included the “eye rolling” for free with the sarcastic remark. The customer said he was embarrased and decided he would not return to Macy’s men’s department anytime soon. Again, another missed opportunity. I like “hold on, I’ll get you one right away” much better. Today I had my own “red hot customer” experience while having lunch at my favorite tavern, The Red Barn. I was painfully aware that I was almost, very almost out of gas and mentioned it to the owner John. He missed his opportunity to say, “you need new glasses so you can read your gas gauge honey ,” and instead went with “try coasting down the hill to the gas station, it’s about 5 miles but it works and if it doesn’t call me and I’ll come and get you.” Bingo the Red Barn has gone from a great restaurant to my favorite! My suggestions: train your employees to listen carefully to customer’s annoyances and take the customer seriously. I think I would have called AAA before John but it sure was a nice gesture. By the way, after he went back into the kitchen the server said, “in addition to being a great cook, John is a really nice man.” Ding ding on the point scale for the Red Barn. Give your employees something to work with. A free drink, appetizer, a gift certificate to Starbucks or wherever just to show they’re listening. I think that winning the sarcastic rating may not get you the customer and being “right” means someone else is wrong. Most people won’t stay in a relationship too long if they’re always wrong. And business is about creating realtionships and it’s not always easy to do. I like Remarkablogger’s ideas about using your blog to create relationships. By the way, if you’re blogging you should be reading Remarkablogger’s posts. Some people are “thin skinned.” That means they are easily hurt. I know, maybe they should be in therapy but that’s not the point of this article. Most women don’t play the sarcasm game like men. They would consider sarcasm nasty and wouldn’t engage in a conversation about how bad Bob looks with his new crop of pimples. My experience is that many women think that men treat each other badly. If we hadn’t seen a friend in a while it’s doubtful that we would say “hey snake what rock have you been living under?” It’s just not our style. While boys were beating each other up on the playground, many women were on the side lines yelling, “don’t do that it hurts.” That doesn’t mean that girls weren’t throwing punches but they were few and far between. By the way, I don’t think anyone really likes a bully do they? I can’t wait to hear your comments. Lisbeth Calandrino is an award winning author, trainer and blogger. She is author of the book, Red Hot Customer Service, 35 ways to heat up your business and ignite your sales. Lisbeth can provide customer service and sales training using the principles of her book at your place of business or through the web. Lisbeth, I am signed up for your email updates, and just love to read them. You offer such positive advice and insight into what makes customers tick! Thanks! Yeah Liz, I’ve had bosses that used sarcasm to get my attention or ‘coach’ me, which I refused to respond to. I’d rather be hit over the head, fired, or disciplined than be treated that way! And when they use it in front of customers about their employees, it actually makes the company look bad and that they have no control over their people. On the flip side, when disgruntled employees use it in front of customers (to get pity, sympathy, etc.) it doesn’t get them the sympathy they want, it blows any trust they earned in the conversation. Enjoying your book on my lunch hour. Thanks so much! Paul, thanks so much for your comment. I don’t know who said that sarcasm was funny when it’s about me or you. I think you’re right on the money, poor excuse for covering up anger. By the way, what would you think about “red hot customer service in a box.” 52 10 minute meetings for your team members, work book and exercises to get everyone improving their communication and giving the absolute best service. Anxious to hear your comments. So glad you’re reading the book, thanks. Hi Rebecca, thanks so much for your comment. Amazing comments from a hotel!